The whole point of my trip to Laos was to get out of dodge and find somewhere peaceful and quiet to concentrate and get focused on my business plan. I know myself well enough to have allowed a week of running around, playing tourist but I was deluded enough to think that I could sit still the following week. In my defence, I had not counted on arriving in Luang Prabang to commence my week’s sabbatical on the first day of Pi Mai – Lao New Year – the biggest festival in the Lao calendar. That was just dumb luck but lucky nonetheless. Pi Mai is officially celebrated from 13-15 April each year. It is steeped in Theravada Buddhist traditions including the sprinkling of perfumed water to cleanse the spirit and sacred objects in preparation for the New Year. Over time however, it has evolved into a week-long national water fight of epic proportions from which no one is safe! Nowadays, it has been likened to ‘Spring Break’ for an otherwise reserved culture. 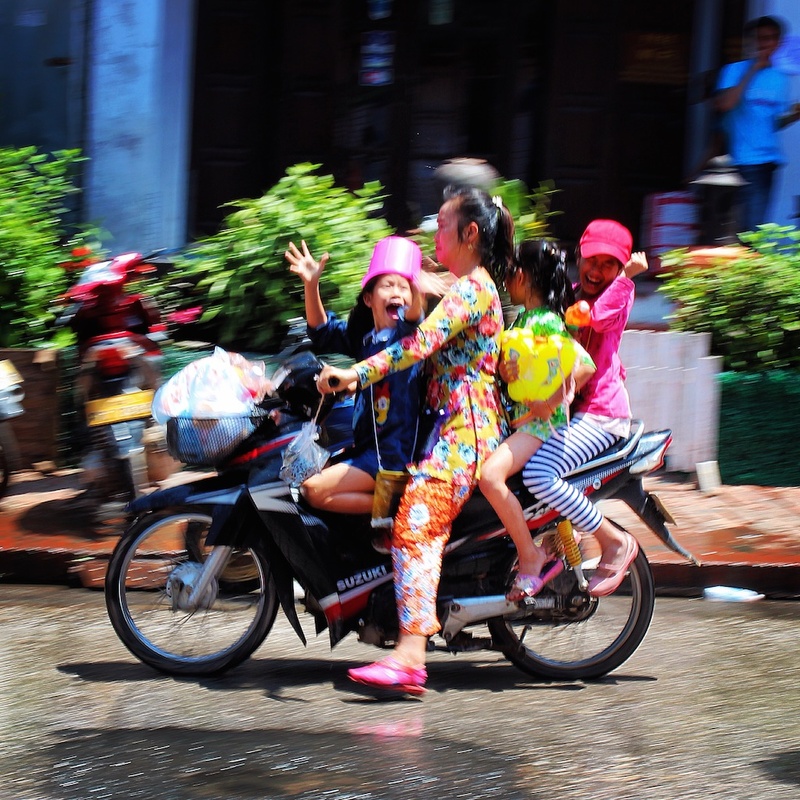 I got my first taste of the mayhem that laid ahead on the minibus ride from Vang Vieng to Luang Prabang – a long, winding trip through the mountainous countryside, dotted with small villages where nothing much happens the other 362 days a year. Just as I was nodding off, I was awoken by an almighty splash against the window I was using as a pillow. I sat bolt upright to catch the unlikely sight of a few bucket-wielding pink and green haired teens disappearing into the distance. 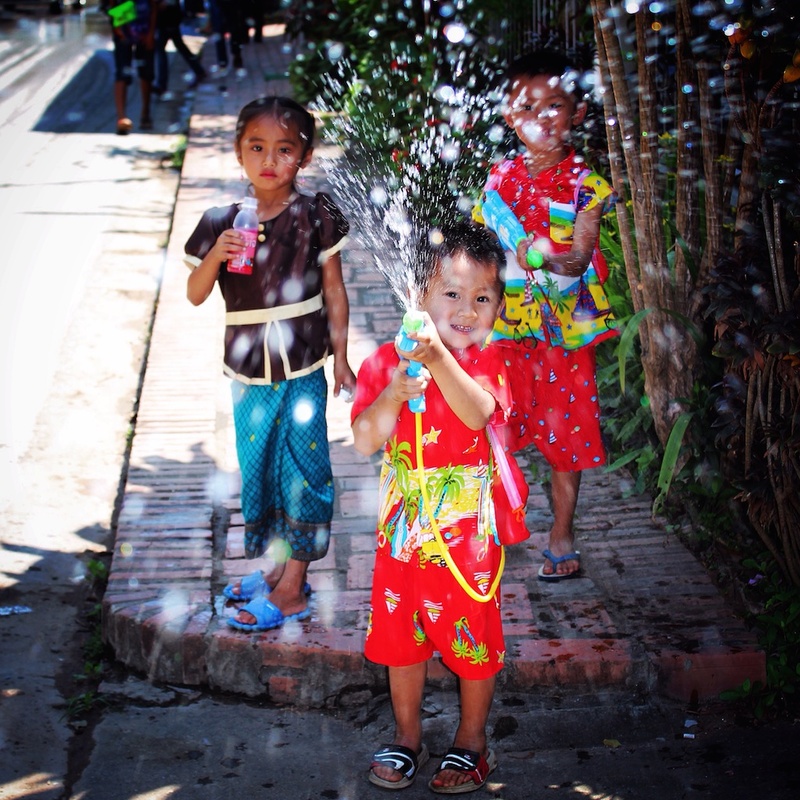 The closer we got to Luang Prabang, the more frequent these guerilla attacks became with many of our assailants being barely old enough to bear the weight of their water pistols. It made me laughed every time. Once we reached the outskirts of town, we were transferred into tuk tuks for a drop off in the centre – open-to-the-elements-tuk tuks, with all of our luggage – I only hoped that my digital devices were packed deep enough to avoid the drenching that ensued. It only worsened as I trudged to my guesthouse on foot under constant, very friendly fire. I turned up on the doorstep of my guesthouse looking like a drowned cat and was taken in graciously like the lost stray that I was. A brief word about my guesthouse: as I mentioned, my purpose in being here was to knuckle down and get some work done. 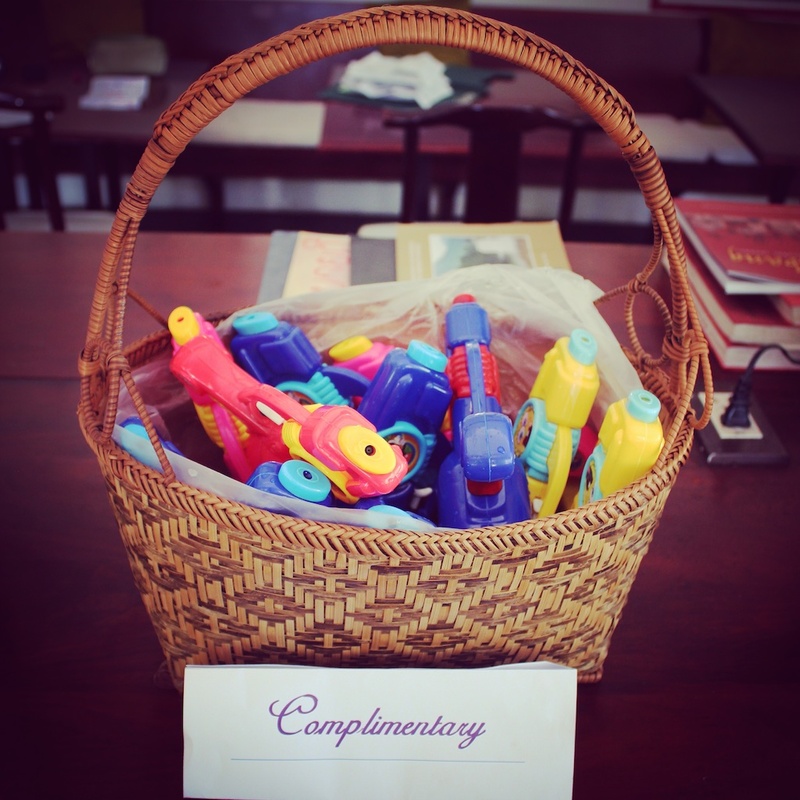 To that end, I decided to splurge a little and book myself in at Villa Ban Lakkham reasoning that I would be spending considerable time indoors so needed more comfort than the standard guesthouse offering (without totally blowing the budget). It was everything I hoped it would be – beautiful, spacious, welcoming and perfectly appointed with a river view from my first floor balcony. This would come in handy in the days to follow as it was just out of splash-reach. Luang Prabang is a relatively small town in terms of the area of interest to most travellers. That area is roughly comprised of 3 parallel streets between the Mekong and Nam Khan Rivers, bound at one end by their confluence and the other end by a clump of backpacker guesthouses and bars. In between is Laos’ highest concentration of temples and stretches of well-worn French architecture. 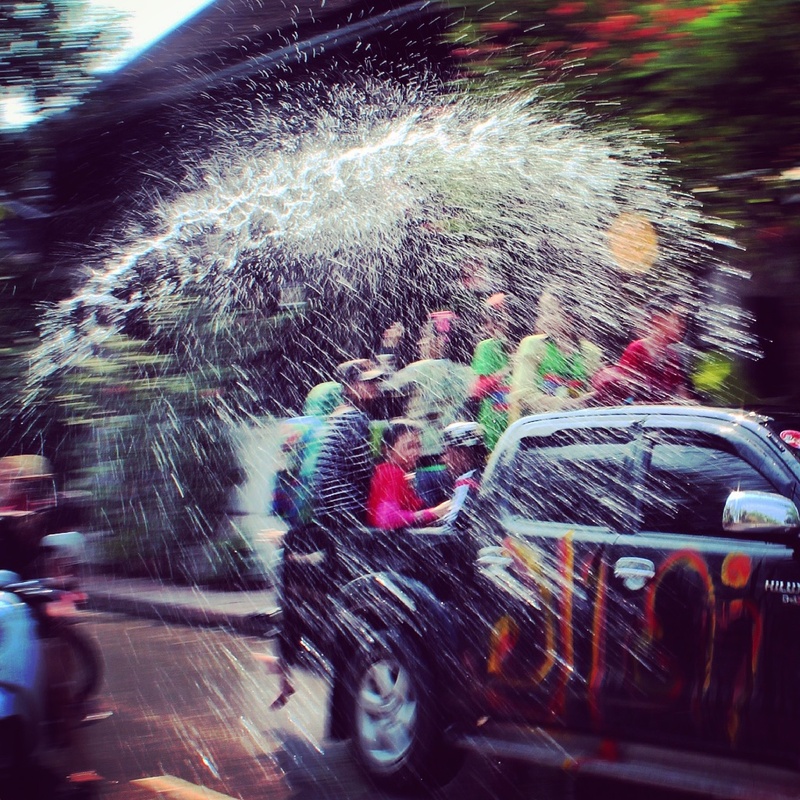 During Pi Mai, these ‘boulevards’ become the staging ground for a constant parade of pickup trucks conveying gangs of water warriors. They wage war with ground forces made up of locals and tourists alike, heavily laden with aqua artillery, strategically stationed around taps, hoses and any other steady supply of liquid ammunition. This is all set to a looping soundtrack of thumping trance music. No one is spared and with the temperature hovering around 40°C, this ‘show no mercy’ approach is the most merciful aspect of it all. In addition to water throwing, the holiday is also marked by other Buddhist and Animist traditions such as the building of sand stupas along the shore and around temples, buying and releasing of animals, a multitude of parades, visiting temples with armfuls of flowers and even the Miss Lao beauty pageant. The party was relentless and infectiously fun. Being a small town on a fairly well established traveller route, it seemed as though I already knew half the people there from previous stops and those I didn’t were easily met in the convivial Pi Mai atmosphere. Nonetheless, without a posse of my own, I didn’t feel inclined to take up arms choosing instead to do my shooting with my carefully guarded camera. By the final day, I have to admit that I was feeling a little battle weary. I thought for sure it must be ready to peter out soon – how very wrong I was! That last day was like all the previous days rolled into one. The wetting of monks was even sanctioned which resulted in a lot of soggy saffron slopping about town. The staff at my guesthouse, who’d been very reserved up to that point, also joined the fray. The minute I set foot outside, I was co-opted into their Pi Mai party at their riverside bar across the road. I was given a magical glass of Beer Lao which never seemed to empty. Consequently, it wasn’t long until Kham, the Assistant Manager, had me up on my feet dancing without a care in the world. I eventually managed to stumble up to the main street to find it transformed into a corridor of pure revelry. 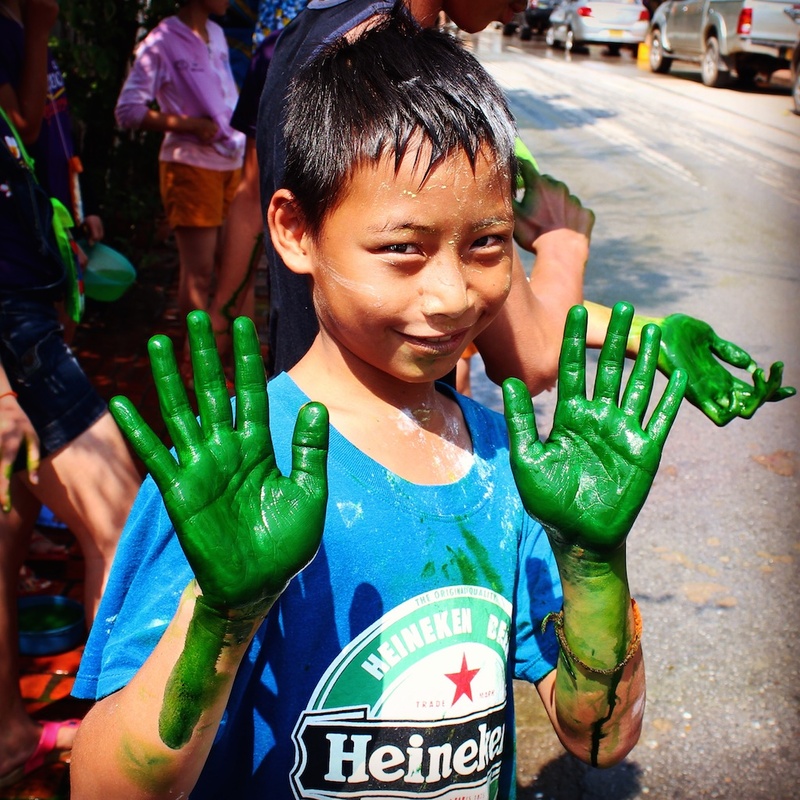 It was impossible to walk more than a few feet at a time without being pulled into a dance circle, drenched with buckets of water, covered in paint and force-fed more Beer Lao. In all my travels, never have I seen locals and visitors so integrated. It truly was an all-inclusive celebration of humanity bought about by the rare and gracious generosity of the Lao people. Sun set and the party dispersed. Pi Mai was over for another year. For my part, I was grateful for yet another new beginning. Having already celebrated New Years in Sydney followed by Chinese New Year, here’s hoping third time’s a charm.